Most people can’t do without an early morning coffee before hitting the road for work. Unfortunately, when in a rush to get out of the home, coffee can spill on the floor and spoil the carpets installed in your home. These stains may disrupt your plans, but do not worry. The stain can be removed with our step by step guide on how to clean coffee stains from carpet. Coffee stains can be particularly annoying because if not treated properly, they can spread to other parts of the carpet. It is important to note that coffee stains must be treated from the outside of the stain and gradually to the middle. Here are specialised techniques explaining how to clean coffee stains from carpet. Removing a fresh coffee stain requires less effort than dried coffee stains. It requires immediate attention. Follow the steps below to clean fresh coffee stains from carpet. Since it is fresh, use a clean towel to blot up the coffee spill. Blot as much coffee as possible and press the clean section of the towel onto the coffee stain until it dries up. Pour cold water onto the coffee stain and blot up the water. Repeat as needed. This is done to dilute the coffee and make sure the carpet is not oversaturated. Get a recommended carpet stain remover for coffee stains. Follow the instructions given by the manufacturer and do not overspray the cleaner on your carpet. After you are done, dry your carpet and it is ready for use. Removing dried coffee stains can be a little bit tedious but similar to the above steps. It requires a lot of repeated effort. Follow these steps to remove the dried stain of coffee from your carpet. Lightly wet the stained area and repeat all the steps required to remove fresh coffee stains. Apply mild soap mixed with water and sponge the solution onto the carpet. Blot it away by using a clean dry towel. Remember, you can do this for carpets made of wool or wool blend. If your carpet is not a wool blend, try a mixture of ammonia and water (a tablespoon of ammonia with a cup of water). Test it out to ensure the mixture doesn’t bleach your carpet. Gently blot the carpet and wait for few minutes. Blot up the solution with a clean towel and allow the carpet to dry. 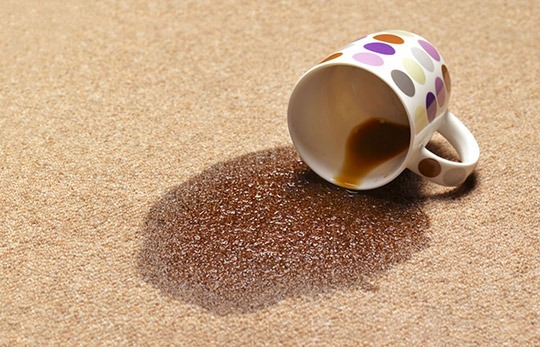 If the coffee stains persist, ask the experts at Sun Dry Carpet Cleaning & Pest Control for a quote. We clean coffee stains from carpet using our sophisticated equipment. For expert help on how to clean carpet stains, do not hesitate to call Sun Dry Carpet Cleaning & Pest Control Brisbane.